After the Japanese attacked Pearl Harbor on Dec. 7, 1941, the West Coast of the United States was gripped by war hysteria and "invasion fever." In the weeks and months that followed, from Seattle to San Diego, any lights seen in the night sky or off the coast were immediately assumed to be the inevitable Japanese invasion of the U.S. mainland. Fishing boats, floating logs and whales were reported as warships, while balloons were thought to be incoming enemy bombers. Every possible hint of a threat was treated as real, and the appropriate response was quickly launched. After the sneak attack at Pearl Harbor, the military didn’t want to be caught off guard again. Nor did the residents of the West Coast. But these were not just the phantasms of a paranoid population. The warnings to prepare for an imminent attack came from the highest levels of the U.S. government and military. 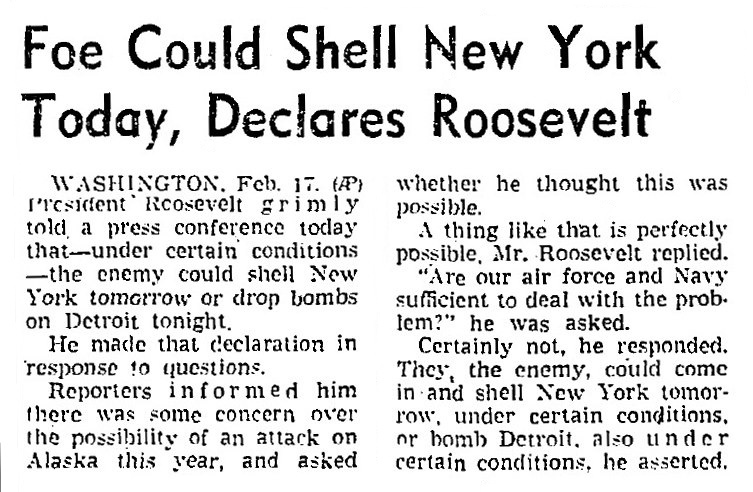 In February 1942, President Franklin Roosevelt warned the nation that enemy planes could drop bombs on New York City or Detroit. 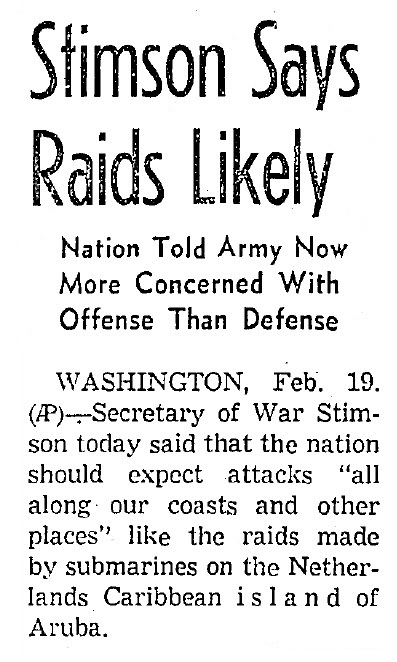 U.S. Secretary of War Henry Stimson said American cities should be prepared for "occasional blows," and enemy attacks "all along our coasts." In addition to a large and concentrated population, Los Angeles had the Lockheed and Douglas aircraft plants, and a large number of oil production and refining operations. The city was the nation's top producer of aircraft, and a Navy armada was based at San Pedro. An attack on Hollywood would hit the entertainment center of the country. The Los Angeles area seemed like a prime, even likely target for the next enemy attack. In late 1941 and early 1942, residents in Seattle, San Francisco and Los Angeles repeatedly received official warnings of incoming attacks. Air-raid sirens blared, military fighters and bombers took to the skies, civil defense teams enforced blackout rules, and anti-aircraft guns opened fire. In late January 1941, Navy planes dropped two depth charges after a "presumably hostile submarine" was reported just off the coast, between Point Vicente and Redondo Beach. 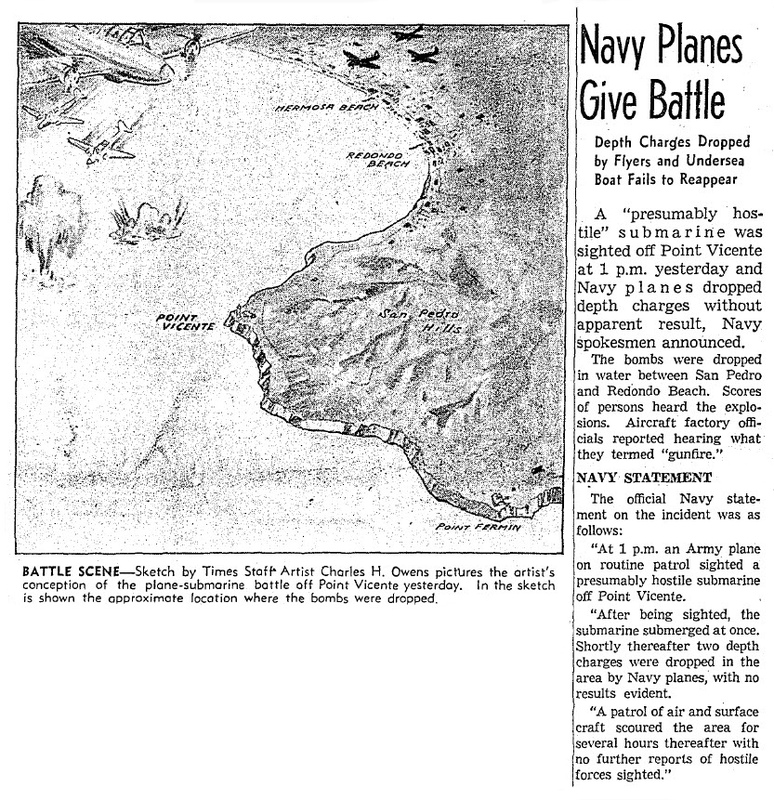 Although all of these "attacks" turned out to be false alarms, there continued to be regular reports in the newspapers about sightings of enemy airplanes, ships or submarines off the California coast. After San Franciscans were told to brace for an attack that never came in early February, Lt. Gen. John L. DeWitt of the Western Defense Command strongly denounced those who treated the alert lightly. "Last night there were planes over this community," he said. "They were enemy planes! I mean Japanese planes! And they were tracked out to sea. You think it was a hoax? It is damned nonsense for sensible people to assume that the Army and Navy would practice such a hoax on San Francisco." There was at least one actual incident that proved to residents that their fears were well-founded and rational. 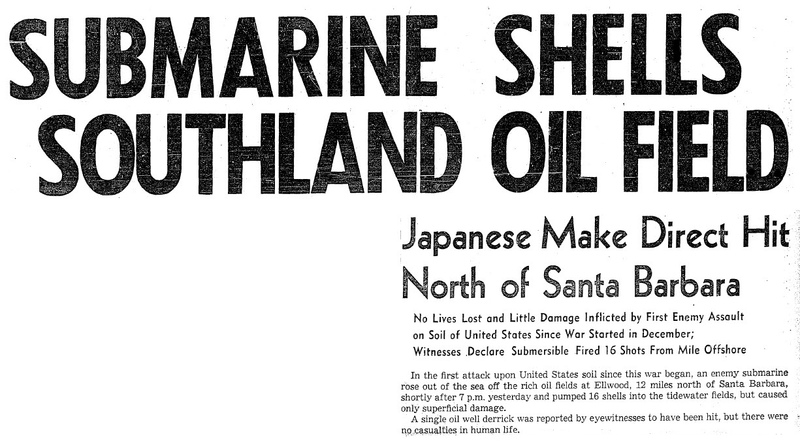 At about 7 p.m. on Feb. 23, 1942, a Japanese submarine surfaced a mile and a half off the coast of Santa Barbara and fired more than a dozen artillery shells toward the Richfield oil field, refinery and storage facilities. The attack did minimal damage to piers and a few oil wells, but the psychological damage was considerable. 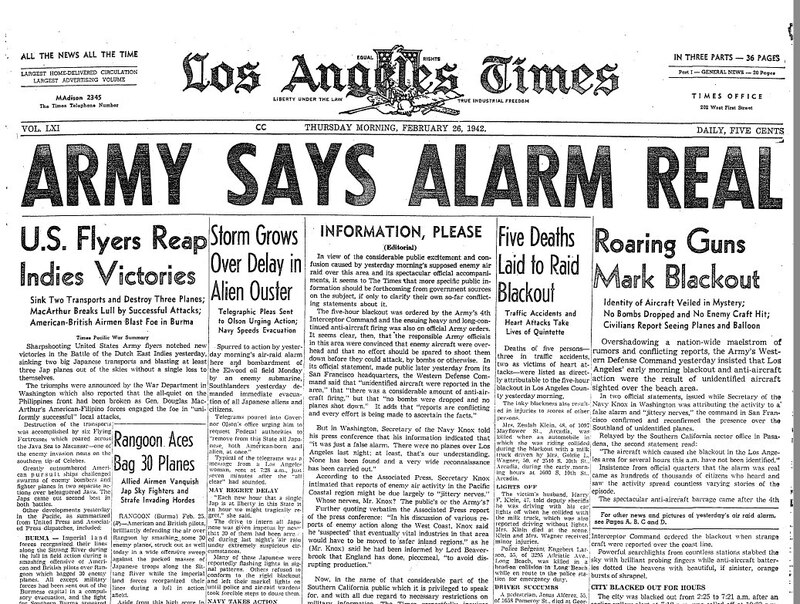 The following day, Feb. 24, with Los Angeles residents on high alert, the U.S. Army issued a warning that an enemy attack could be expected within the next 10 hours. The alert was lifted at about 10:30 p.m. A few hours later, however, military radar detected an unidentified object about 120 miles off the coast, heading directly toward Los Angeles, and air-raid sirens blared across the city. Anti-aircraft batteries were ordered to prepare to fire, and a wide-spread blackout was ordered. At about 2:30 a.m., the mysterious object disappeared from radar screens. Even so, rumors quickly spread from official and unofficial sources -- enemy planes were seen over Long Beach, and a coast artillery colonel reported seeing about 25 planes flying at 12,000 feet over Los Angeles. There were reports that as many as four Japanese planes had been shot down, including one that crashed in flames at Vermont Avenue and 180th Street in Gardena. A large object reportedly fell near the intersection of 43rd Street and Western Avenue, in the Leimert Park neighborhood, but witnesses weren't sure if it was an enemy plane or a bomb. To assist anti-aircraft gunners, 4-foot meteorological balloons were regularly sent up to monitor wind speed and direction. When a balloon carrying a flare was seen over Santa Monica, four batteries of anti-aircraft artillery opened fire on the target, which sparked more weapon fire throughout the region. 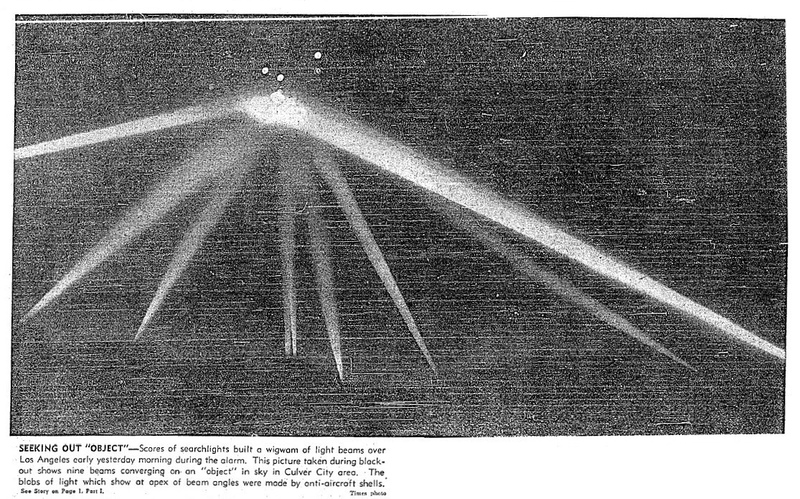 Over the next three hours, searchlights and artillery fire crisscrossed wildly in the skies over Los Angeles. Whenever the lights and shadows and puffs of smoke from bursting anti-aircraft shells looked like another incoming wave of enemy planes, the artillery would start firing again. Shoot first, ask questions later. When the smoke finally cleared and the sun rose on the morning of Feb. 25, officials surveyed the damage. There were no crashed enemy planes, no bombs dropped. 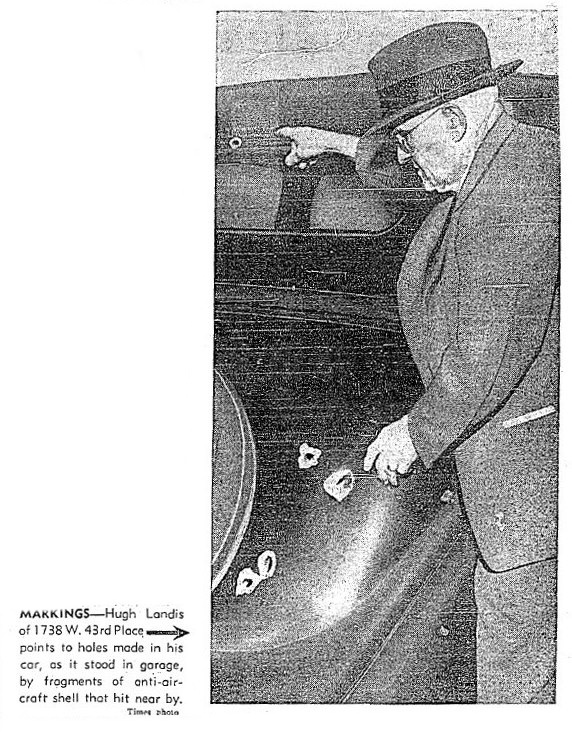 More than 1,400 anti-aircraft rounds were fired, but the only damage done was caused by bits of shrapnel that rained down on rooftops and parked cars. Only two people were reported injured by falling shell fragments. There were, however, five casualties -- three people were killed in traffic accidents due to the blackout, and two died from heart attacks attributed to stress and anxiety. Even with no supporting evidence of an enemy attack, the military was still reluctant to call the incident a false alarm. The Army's Western Defense Command officially insisted that the incident was caused by incoming aircraft that "have not been identified." While Secretary of War Stimson claimed that as many as 15 enemy planes had flown over the city –- taking off from secret air fields in California or Mexico, or light planes launched from submarines -- Navy Secretary Frank Knox said, "As far as I know, the whole raid was a false alarm ... attributed to jittery nerves." Real or not, the incident further shredded already-frayed nerves of Los Angeles residents who knew that an attack was possible, maybe even probable. And they prepared as well as they could. Like nearly everyone living along the West Coast, Derwin Lyon, 44, of Huntington Park, a few miles south of downtown Los Angeles, was concerned about an enemy attack. Lyon had worked for more than 12 years as a machine operator at Air Reduction Sales Co., on Laura Avenue in Huntington Park. Among its other products and services, the company sold compressed air and oxygen in tanks for commercial use, to businesses and hospitals. Rather than just worry about an enemy attack, Lyon took steps at his home on Marbrisa Avenue that he thought would protect him, his wife, Lena, 41, and their five children -- Catherine, 20; Mildred, 15; Billy, 13; Helen, 6; and Bobby, 3. Nearly every room of the Lyon home was equipped with a fire extinguisher. Lyon was particularly concerned about a poison gas attack, so he configured one bedroom of the house so that it could be sealed off from outside air. He brought two tanks of compressed air and one tank of oxygen home from work to be used in the air-tight chamber. The family even conducted regular rehearsal drills, so that they would know exactly what to do, and to test the system. They would gather in the "safe room," seal off the windows and doors, and Lyon would turn on the air and oxygen tanks. After a few minutes, he would turn off the tanks and open a window, then strike a match to see if the air was clear. By 1915, the family had moved to New York, and Derwin followed his father into the watchmaking business. Derwin then moved to Nebraska, where he met and married Lena Mary Nesbia in about 1921, and their first child, Catherine, was born the following year. Daughter Mildred was born in Texas in 1927, after which the family moved to Los Angeles, where Derwin found work at the Air Reduction Sales Co. The couple's third child, William, was born in 1929, followed by Helen in 1936, and Bobby in 1939. Lena Nesbia was born Feb. 16, 1901, in Nebraska, the youngest of three children of Frank and Mary Nesbia, both Austrian immigrants. 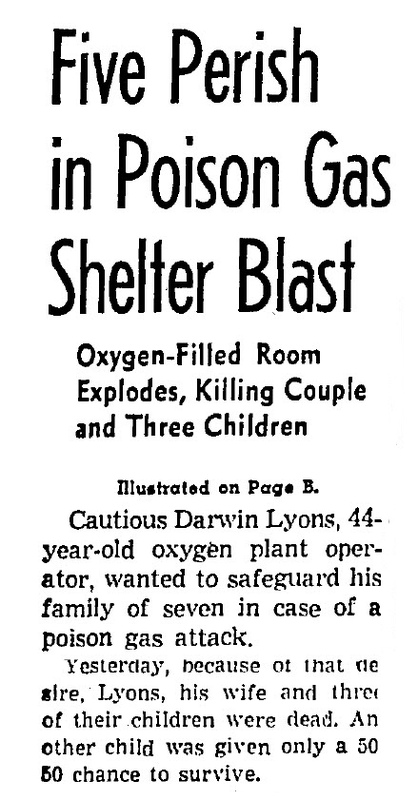 On the evening of Tuesday, June 23, 1942, Derwin Lyon decided to hold a longer drill in the family's "safe room." The entire family gathered in the bedroom, except for Bobby, who was asleep in another room. They sealed the room, turned on the air tanks, and remained in the room for nearly 15 minutes. As he had done previously, Lyon turned off the tanks, opened a window and struck a match. Immediately, the entire room erupted in flames -- furniture, curtains, clothing, even the wallpaper was on fire. The explosion was heard for blocks, then neighbors heard the screams of the family members as they ran out of the house to escape the flames. Some of the neighbors rushed out with blankets and rugs, to attempt to smother the flames. Six-year-old Helen, who suffered from polio, was the first to die. She was found in a small clothes closet in the bedroom, wrapped in a blanket she apparently used to try to smother the flames. 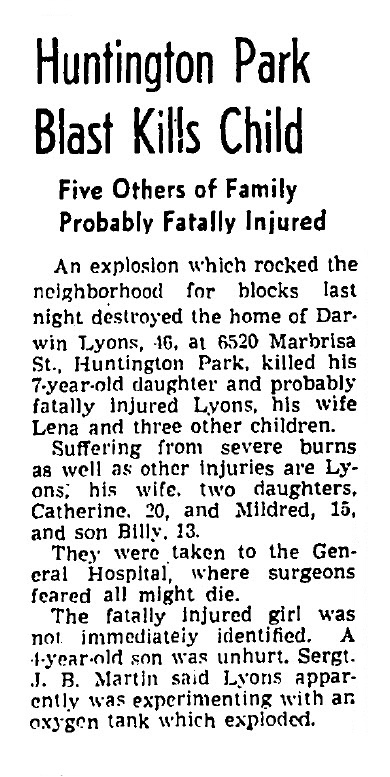 The other five members of the Lyon family -- Derwin, Lena, Catherine, Mildred and Billy -- were taken to Los Angeles County General Hospital in Boyle Heights, all of them suffering severe burns. Derwin, Lena, Catherine and Billy all died the next day; Mildred died a day later. 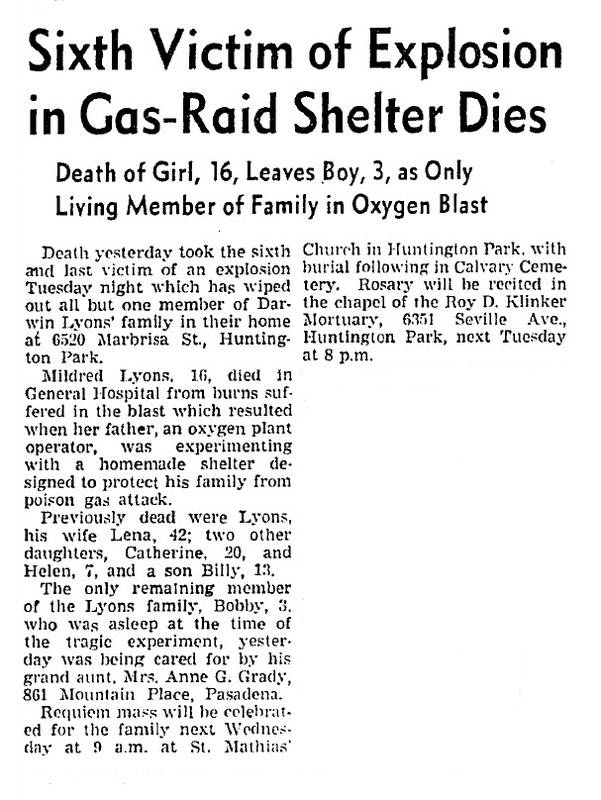 Bobby Lyon, the only family member who survived the fire, was placed in the care of his aunt, Anna Grady of Pasadena. A funeral Mass for the family was held at St. Matthias Catholic Church in Huntington Park. 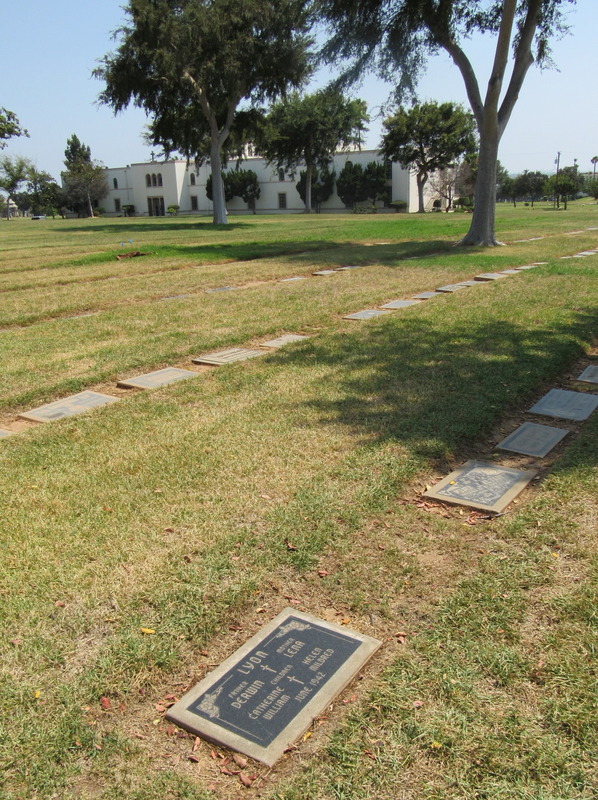 The six family members were buried together at Calvary Cemetery, in Section N, behind the main mausoleum.